I'm having a big problem with the Image manager to upload and add images to my products. strangest thing of all is that after 3 secondes the admin login screen appears where the images belongs and the background changes after my buttons. I attached a printscreen of my image manager as i see it. I am having the EXACT SAME problem here, man. Anybody out there who can help?? I have the same issues~ anyone can reply this post for support? I also have the same issues~ have you fix it? 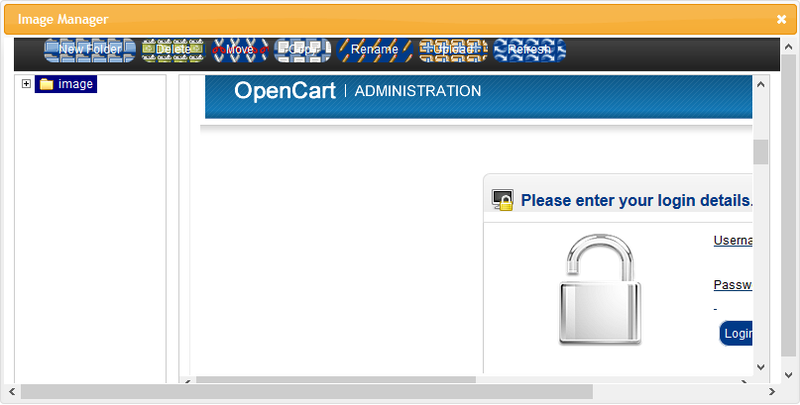 I'm having the same issue with opencart 1.5.5.1. After several hourso of hard work, translating the site, making all the setings... I tryed to add the fist product. Well... I got this... issue. Could be our fault? Do we need some specific kind of settings for the newly added FTP feature? You are encountering a problem that arises at least two ways. (1) When in the admin panel you fail to wait until the twirling down in the status bar (bottom of screen) stops, then you face a virtually unit probability (1/1) that you will be required to log back in. Quick fix: slow down. (2) When in your browser in side by side tabs you busily work simultaneously or concurrently with both your cart (most notably as a logged-in customer) and your admin panel, BOTH your cart and your admin panel are likewise at the same time setting mutually incompatible cookies, and BOTH will alternately mandate that you log back in. Quick fix: do the cart or the admin panel rather than both at once; or use separate browser copies (if you can run them) or browsers (if you have them installed) or machines (if you can connect them). Hello, I'm riding my shop I have a huge problem, the server does not allow upload images from admin panel of the store, from what I understand every time you use the jquery ajax or it drops the session. please support! The image manager's foremost job is generally to select images (which go into two different Product tabs), and (unseen) to make thumbnails from the original images that you put on the server. If for any reason you cannot use the image manager to upload images to the server (prior OC versions without ftp capability, recent OC versions with perhaps but likely not a glitch, server settings or requirements), then you can use a normal ftp client (freeware FileZilla Client and a few others are well received) for a fairly ordinary server that does not use security certificates, or use freeware WinSCP or something similar instead for a server with dead serious security certificates that even FileZilla may or may not be able to enter. (A) You'll need to set up the ftp client or scp client to know these several particulars, which in this list are common and not exhaustive. 1./ The host.-- Your hosting arrangements and your domain's dns values, among other things, may dictate whether that host should be identified by a decimal quad dot number (0.0.0.0 to 255.25.255.255) or by an intelligible name (example.com). Try both if need be. 2./ The host's operating system (or type).-- Linux, Windows, Auto are usual examples. 3./ Protocol.-- FTP and which type, or other. 4./ Encryption.-- Plain, explicit, implicit, etc..
5./ Logon.-- Anonymous, Normal, Passworded, Interactive, Account, etc..
h./ others of similar nature. 7./ Directory defaults.-- That's where to start in the directory trees on your machine and the host. 8./ Adjustments.-- You'll find settings for timezone offsets, for preserving timestamps, forcing display of hidden files, and other niceties. 9./ Transfer settings.-- Most of the time start with Passive; certain cloud servers require Active. Servers may well limit simultaneous connections (I would guess that nowadays most do). 10./ File transfer mode.-- Binary (coded, whether pictures, executables, .pdf, word-processor, etc.) and ascii (text, whether plain or html, etc.) files of various sorts need to be sent as binary or ascii. Auto is a good choice to start. 11./ Character sets.-- Auto is good, unless you know with fair certainty to set a specific character set. (B) Your own images must be uploaded into the proper place in your store's directory tree. You'll find a directory (dir) named "image" (singular; with NO "s"). Under image/ you'll find (1) a subdir named "cache" and under cache/ a further subdir named "data" (both for images the software will make from the originals); and, also directly under image/, you'll find (2) a subdir named "data" (for the originals that you upload, and from which the software makes the thumbnails). Upload your own images into the latter place (2). You can put your own subdirs into both of the data/ subdirs to help sort pictures (somewhere along the line you will probably need to do so just to help yourself find them). Those dirs may vary a little bit among versions but the idea holds. (C) You can use the ftp or scp client to see directory and file permissions, and to set them (technically directories are files but we all know that one can't put files in files the same way as into directories, one makes a new concatenated or edited file to do that, and we accordingly refer to them differently), as well as to make and delete your own directories (subdirs are still dirs). Everybody goes through this, it's usually quickly understood and mastered well enough to do it. Hello I have followed the most of the suggestions that you gave, however my problem is similar with vicky241 and still remains.. Can you be more specific if we can upload the pictures manually? If you're being kicked out at quick intervals, then you would seem to be fighting cookies (one per session per browser at the same time works, more than one, you must log back in). For manual transfers (B above), sidis, go into the server via FileZilla Client (preferred, but there are others), or if it's dedicated go in via scp (tighter security), but the idea is to connect, log in, then in left/right or upper/lower panes navigate to put your own machine's directories and the server's directories in comparable views, and then to drag the images from your machine to the server, specifically into the correct directories. For images, the correct directory on the server is /image/data (NOT /image/cache). butte wrote: If you're being kicked out at quick intervals, then you would seem to be fighting cookies (one per session per browser at the same time works, more than one, you must log back in). Hello butte, I know that this thread is a little bit old, however, I'm getting the same problem here. I transfer the images through FTP already, however, when I try to select any image to input it into a banner or product image I got kick out and need to Login again. I didn't found the problem in any other place, just here, but I'm still without solution. Could one of y'all please test to you see this error also appears if you try to load the filemanager by adding an additional image to a product on the Data Tab of the product form, rather than the main image on the Data Tab? I ask, because I wonder if this issue is related to the issue I just filed, http://forum.opencart.com/viewtopic.php?f=161&t=104878. Dunno. Gotta run into variants and test as we go. Hello Butte, I have the 1.5.5.1 version. I'm not uploading files through the file manager, I'm just managing the images for products and banners with this tools, because I don't have another way to change pictures/images inside OC for products or banners. What I need is that the image manager just keep doing what it is made to do. I've tried everything, I've changed the .htaccess, I've increased the image size, I've changed the PHP version, I've changed the timeout... and still got this problem. @GugaJedi - have you tried replacing the filemanager file(s) with those same versions of 1.5.4.1 and see if you still have the same problem? I fixed my issue (see link in my earlier comment on this thread) by replacing filemanager.tpl. There's a new instantiatation of AjaxUpload added to the bottom of the 1.5.5.1 version that I think may be causing the problem, at least it was for me. I am just guessing that you may have the same problem, but your server reacts differently than mine and so the result looks different. Please try it and let me know. It may be that "a new instantiatation of Ajax" in numerous (not necessarily abundant) places contributes overall to Ajax background or mistimings to unique extent in 1.5.5.1 OC. garuda wrote: @GugaJedi - have you tried replacing the filemanager file(s) with those same versions of 1.5.4.1 and see if you still have the same problem? I fixed my issue (see link in my earlier comment on this thread) by replacing filemanager.tpl. There's a new instantiatation of AjaxUpload added to the bottom of the 1.5.5.1 version that I think may be causing the problem, at least it was for me. I am just guessing that you may have the same problem, but your server reacts differently than mine and so the result looks different. Please try it and let me know. Hello garuda, can you help me fix that problem? where do I upload the *.tpl file that you've attached to you previous post? I didn't find where I should upload that. Look in /admin/view/template/common/ (directory) . . .
for /admin/view/template/common/filemanager.tpl (file) . . .
then put the new one there and rename the new one, filemanager1541.tpl to filemanager.tpl . . .
Familiarize yourself with your directory structure and files, you'll need the familiarity for reviewing security on your server from time to time. butte wrote: Look in /admin/view/template/common/ (directory) . . .
Butte, I've done the change, the tpl from the 1.5.4.1 version is there, but now the file manager open ok, but show nothing inside it, no folder list, no images in the default directory.